walk the sensory streets of Hanoi, sail through Halong Bay’s fascinating scenery, bike Ninh Binh’s rural countryside, to exploring the enchanting ancient city of Hoi An. Standing at the street corner I couldn’t help but feel a bit anxious thinking about crossing the road. My eyes were fixed on the sign, waiting for the "walk" to magically appear. This wasn’t just any ordinary stoplight, this was a street corner in Hanoi, Vietnam — the capital of the country and the metropolis' main way of transport for motorbikes and scooters. As a first time visitor to Vietnam’s second largest city, I was amazed at the number of vehicles zipping around in a form that resembled chaotic disorder. The beeping, honking and muffler rumbles that roused my nervous system, oddly, had a systematic and fluid movement. Nonetheless, there was an intensity that came with the sights and the sounds of being on high alert with every step. It seemed as if I were in a video game dodging objects in an attempt to get to the other side without being flattened like a pancake. “You with me?” he said. “We’re going!” I inhaled deeply grasping onto Ryan’s arm as we took those first steps and ‘walked with confidence’, ‘kept moving forward’ and made sure ‘not to step back’. Funnily enough, we had very specific and thoughtful, written instructions from our hotel on how to actually cross the street! As the hang of the street crossing became somewhat familiar to us, we meandered our way through the city to explore the sites. More interesting than the points of interest on the map, was the atmosphere of sidewalk dining. Street food carts surrounded the roads while an array of miniature plastic stools and lunch tables lined the narrow walkways. A woman squatting on a small chair washed dishes in a sudsy bucket, another stirred chicken into a boiling pot of of soup mixed with vibrant garden greens. Complementing this scenery, sensational aromas of fresh herbs, pungent fish sauces and simmering beef, engulfed my senses. 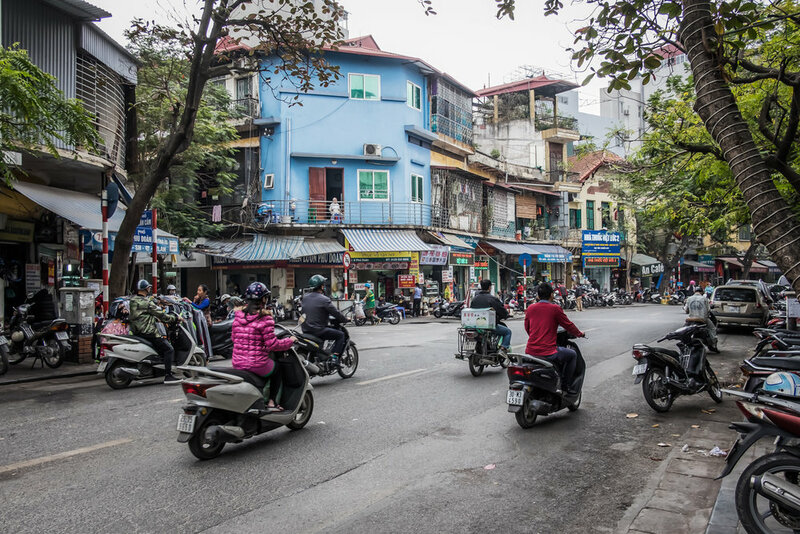 The number of scooters parked neatly in rows on the sidewalks was incredible, to the quaint and colorful French architecture of both homes and establishments nestled onto the tree-lined streets of Hanoi. A woman wearing a Vietnamese hat (Nón Lá or Conical Hat) rode a bike filled with buckets of flowers for sale. Another hatted lady balanced a pole on her shoulders with two baskets hanging on each end (Quang ganh) laden with greens and vegetables. A man on his balcony performs a form of meditation or prayer movements, poised and graceful. Another weathered soul peers from his porch taking notice of all the activity going on below — his face worn; his eyes look tired. From across the street below we make eye contact and I wonder about the story he holds. Man doing meditation in the distance. We make our way to an opening where there is a small lake in the center of the city. It was as if we had been gracefully pushed into an alternate world where we crossed a roundabout with ease — serenity in the midst of chaos. Here we found joggers making their way around the path, locals taking engagement photos, others relaxing on benches, and like us, those wandering around this bustling capital of Vietnam, exploring the character and authenticity of what it is really all about — appreciating the historical beauty and deep rooted culture in the midst of its’ presence. A couple sits by Hoan Kiem Lake in Hanoi, Vietnam - Tháp Rùa also called Tortoise Tower in the distance. Be sure to check back for Part 2!